If the calculations that Dutch scientists made are correct, you burn more than 5 grams of fat extra for every cup of green tea you drink, according to a meta-analysis published by Rick Hursel in Obesity Reviews. Westerners who want to speed up their weight loss have been using green-tea extracts since the 1990s. That’s not so surprising: a 200-ml cup of green tea contains 30 mg of caffeine to start with. Caffeine raises the concentration of pep hormones like noradrenalin in your body, and helps cells to react better to the hormones. As a result fat cells release their content faster into the bloodstream and the energy expenditure of the muscles and organs rises. Green tea also contains catechins, which reinforce the effect of caffeine. Catechins, for example, inhibit the enzyme COMT, which normally breaks down pep hormones. And catechins also activate hormone-sensitive lipase in the cells. This is an enzyme that cuts up fats in free fatty acids. More active hormone-sensitive lipase therefore means more fat burning. An attractive sounding theory. But does the theory hold water too? This is the question that Hursel wanted to answer in his meta-study. Hursel collected 39 previously published studies on mixtures of catechins and caffeine. Six of these were suitable for use. The figure below is a summary of the results in those studies. The extent to which green-tea extracts boost the fat burning varies from study to study, Hursel discovered. This is probably because indigenous Europeans, more often than Asians, produce a version of the COMT enzyme that can withstand sabotage by catechins, and Europeans are used as European subjects in many studies. 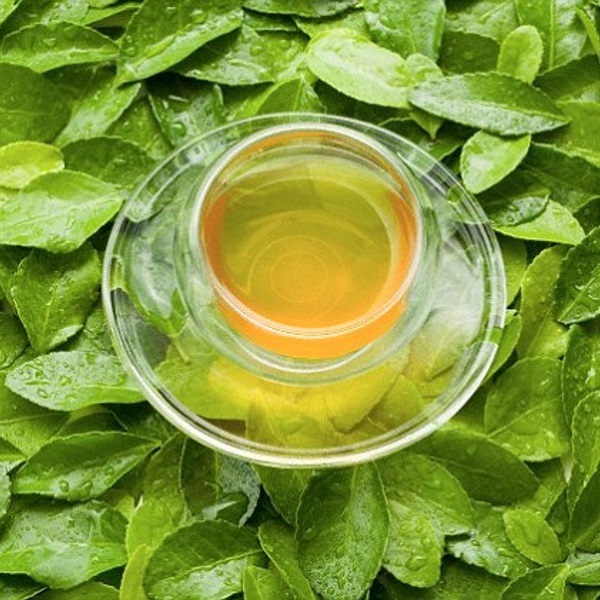 Nevertheless, green-tea extracts boosted energy expenditure in the average studies by about 4.7 percent. Hursel was even able to calculate how much extra fat your burn if you take a green-tea supplement: every mg of a mixture of caffeine and green-tea catechins boosted the amount of fat burnt daily by 0.02 g. Hursel also calculated that every milligram of pure caffeine boosts fat burning by 0.01 g per day. The table below shows a breakdown of the substances in 100 ml of green tea. We found the table in a database of the US Department of Agriculture. A 200-ml cup of green tea contains not only 30 mg caffeine, but also 253 mg catechins. Together that’s 283 mg. Times 0.02 is 5.7. Drum roll…. So every cup of green tea you drink boosts your fat burning by 5.7 g. If you drink three cups of green tea every day for a year, that adds up to 6.2 kg fat. And that’s about 8 kg of body fat. Now that’s worthwhile.